1873-78. First appearance of one entry between Yarra Park and Wellington Parade: Mrs. Mitchell, refreshment house. 1882-83. Name mentioned: Mrs. Emily Bayly. 1881. Subdivided. 1884. Terraces and other houses on blocks south of school. 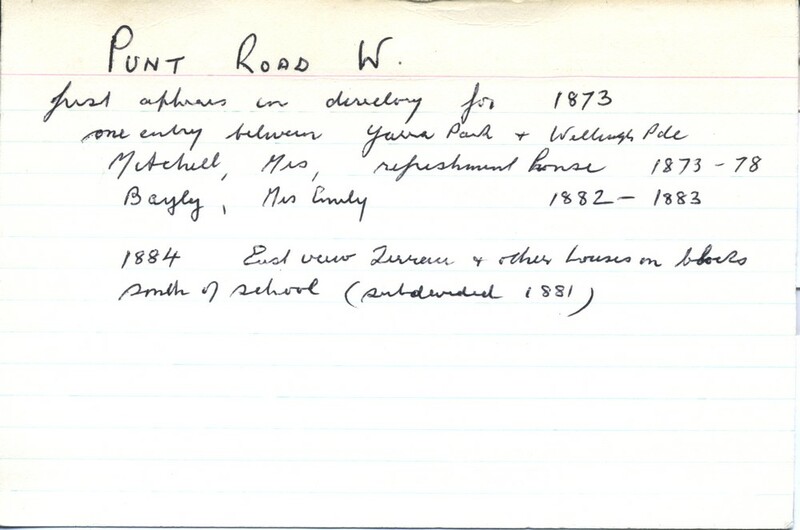 Part of Winston Burchett's index card set, created and used by Winston Burchett to support his research and writings. The set of cards is held by the East Melbourne Library and is fully digitised and published by the East Melbourne Historical Society with the permission of the Library. The reliability of the information in this set of cards varies considerably. It should not be used as a primary source but as a lead to other sources.